I’m too much of a grande poulet to have my hair turned pink. However, as chance would have it, I know a young, good-looking editorial assistant who’s pretty much game for any follicular frolics. Step up to the scissors, Sophie Hadjikyriacos, Muddy HQ’s intrepid youngest employee – it’s time to transform. My poor hair was flat, lifeless and in terrible condition from years of mistreatment – frequent blow drying, excessive straightening and curling without heat protection are just some of my crimes. It had also been at least six months since I had it coloured so my blonde ombré was looking very faded. 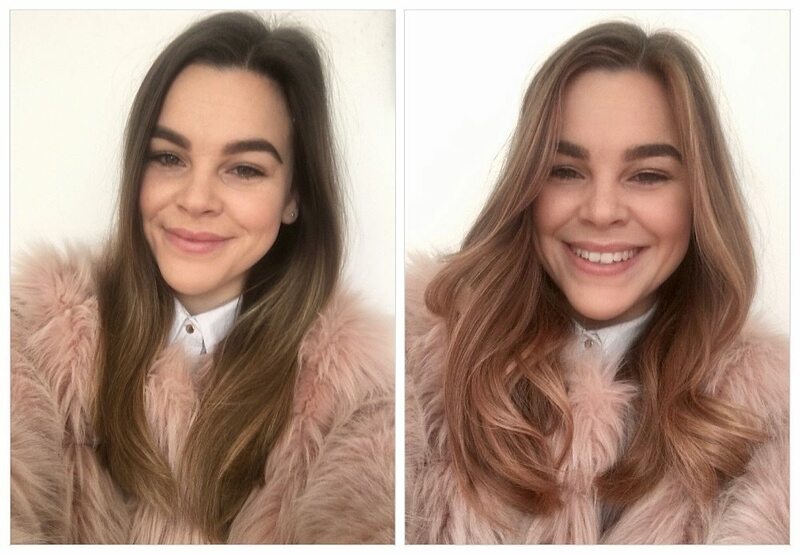 I was feeling particularly brave and wanted something a bit more fun for Spring – so hello rose gold balayage! It’s a big celebrity trend with Cara Delevingne, Sienna Miller and Kate Hudson currently rocking it. And now me too. 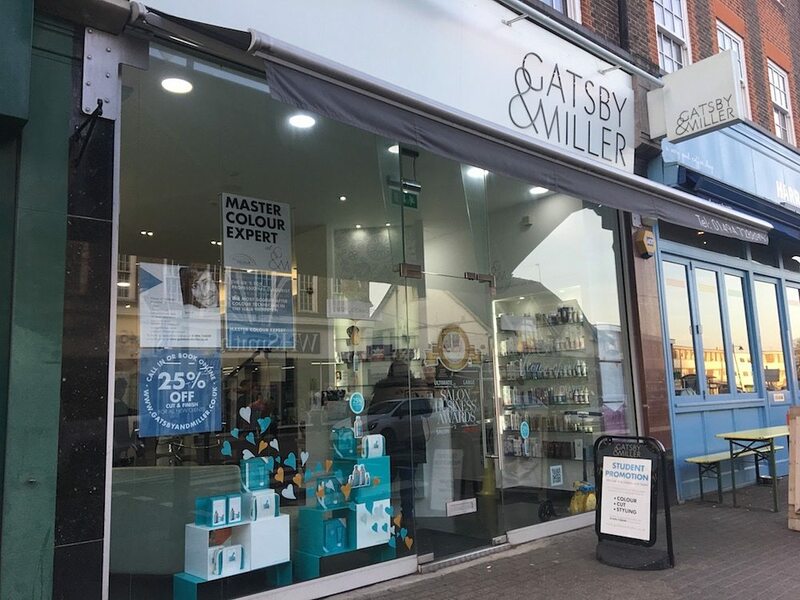 In the middle of Amersham’s bustling high street, tucked between a Harris + Hoole coffee shop and Holland & Barrett, Gatsby & Miller (a 2016 Muddy Award winner) has an upmarket feel, with bright and airy floor-to-ceiling windows and slick monochrome decor with splashes of duck-egg blue (even the products match). 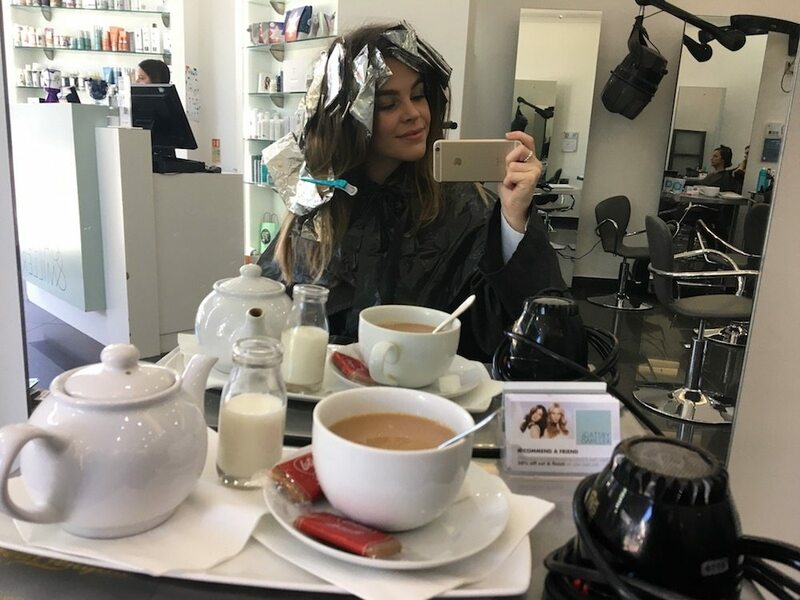 There are 11 hair stations, nine stylists, three sinks, lashings of tea and coffee and, most importantly, lots of up-to-date glossy mag reading material. Good job because I’m in for a four hour stretch. Yep, four hours. But good things come to those who wait. 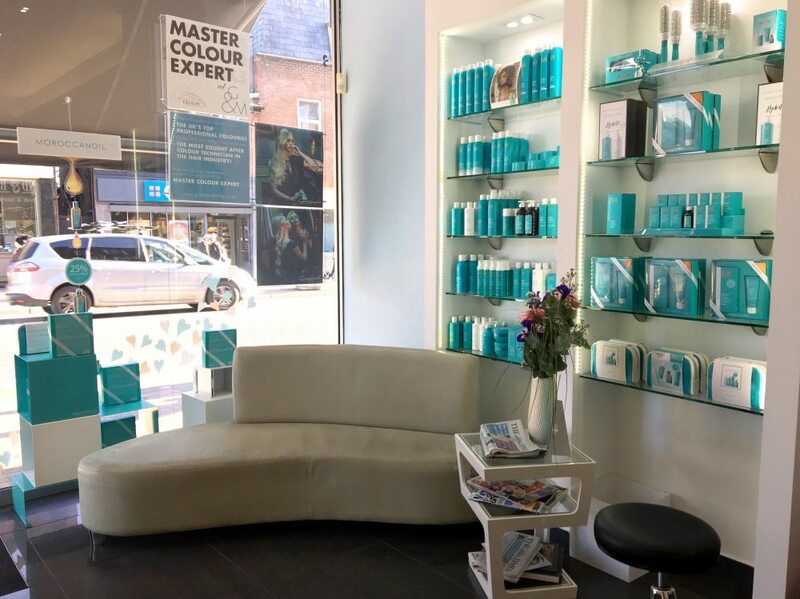 The stylists and colourists are trained by Wella and Moroccanoil, with the salon specialising in a hard-to-find hair loss treatment, which uses nioxin to regenerate growth. 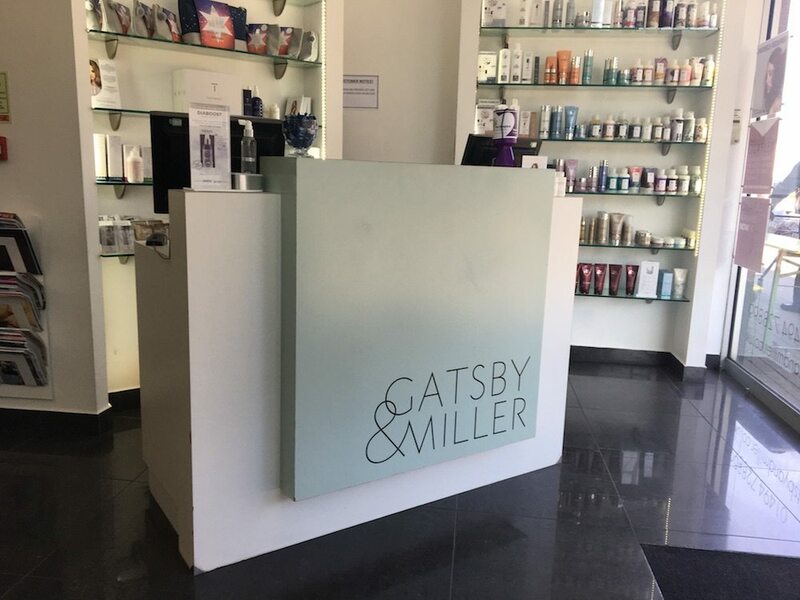 Gatsby & Miller is an upscale salon but everyone was friendly and quick to compliment each other on their work. Their customer service extended to putting an new parking ticket in my car when I realised it was running out (oops). 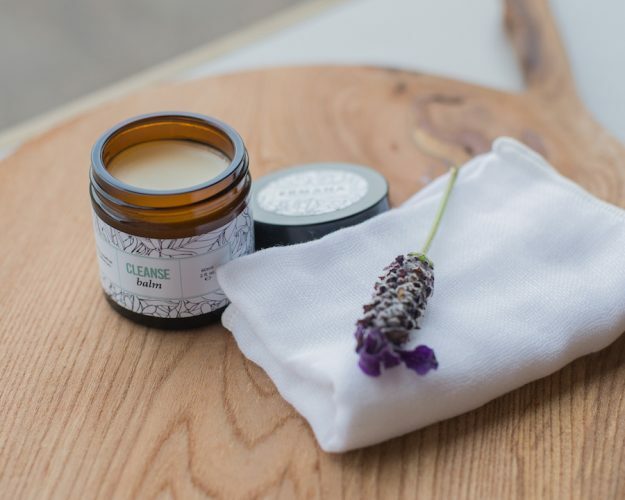 My stylist was salon director, Deepa Tailor, who’s been on board since the salon launched in 2011 and hairdressing for over 20 years in total, previously working in London, styling the ever-cool TV presenter Emma Willis, among others. A good sign! I’m naturally a dark brunette so I had to go gold before I went rose otherwise the pink wouldn’t show – this is why it’s such a long process. Deepa framed my face with babylights (like highlights but finer) at the roots and gradually blended these out into the balayage so it would last longer when growing out. She used a technique I had never seen before – brushing back the strands before applying the colour which apparently prevents it forming a flat line. The dye was mixed with Olaplex, a fashionable bonding treatment (the Kardashians love it) that restores broken hair molecules. Think turbo-charged conditioning that actually mends the hair rather than just smoothing it. Lastly, toner was applied, and washed off 20 mins later to reveal a dramatic rose gold finish. I always play it safe when it comes to the cut as I am rubbish at styling hair myself but Deepa suggested ‘long bangs’ – short layers at the front that act as two side fringes to give it some shape. Worth noting: if like me, you have all the gear and no idea, get down to one of the salon’s regular ‘discovery events’. 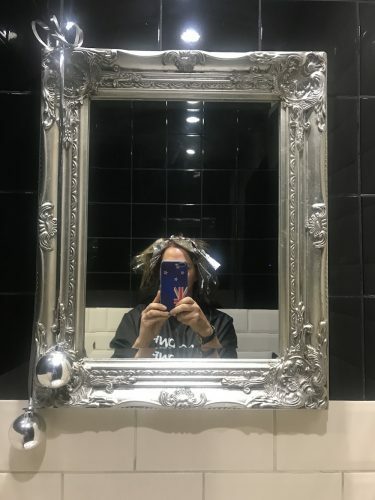 You can bring in your own hair appliances and the staff will show you the best way to use them and where you might be going wrong at home. SIGN ME UP! I was really worried throughout the whole process (what if I look like a clown?! How the hell am I going to tame ‘bangs’?) What’s more, this was my first venture into the world of whole head colour and indeed fringes. But four hours later, I was thrilled. I love everything about it. The photos don’t really do it justice – the colour was far more dramatic in the flesh. The biggest surprise was how soft it felt despite the amount of bleach involved. And look – no more flyaway ends! Deepa taught me a neat at-home styling trick to make my bangs flick outwards – you just wind them around an old-school Hilda Ogden-style roller. A few weeks on, I’m enjoying experimenting with them hanging down or clipped back in a slick middle parting ponytail. This look will set you back a hefty £201, so it’s definitely a treat. That’s £140 for the colour and £61 for the cut, but then, I was in the salon for four hours. Plus, those costs are less if you choose a stylist lower down the ranks. If you’re looking for something more traditional, a half head of highlights costs from £55 and a cut from £38. A word of warning though – I wasn’t aware just how temporary toner is. My lovely pinky look had faded within a couple of weeks, albeit leaving those cute baby-lights underneath. So going rose gold is something I’d do for an occasion or event – next time I’ll remember to go back and grab another batch of toner. Gatsby & Miller, 45 Sycamore Road, Amersham, Bucks HP6 5ED; 01494 728899.